Sarah and Laura Ayoub are classically trained, multi-instrumentalists who cross the boundaries between classical and contemporary music. 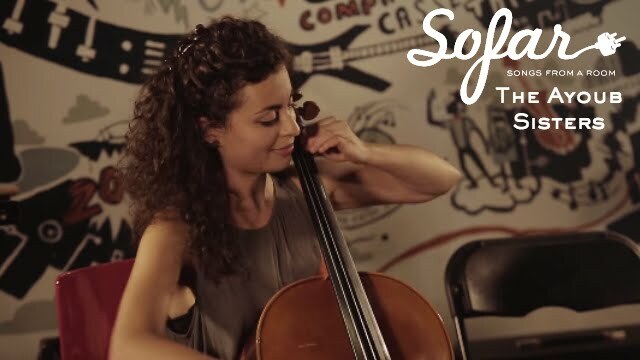 The Scottish – Egyptian multi-instrumentalist sisters Sarah and Laura Ayoub are being heralded as the new sound and faces of the classical and crossover worlds. Discovered by Mark Ronson, the girls were invited by Classic FM to make their Royal Albert Hall debut at Classic FM Live. After their thrilling performance, they were immediately signed by Universal Music's iconic label Decca Records, in a unique joint venture with Classic FM. Their first two singles, ‘A Christmas Fantasy’ and ‘Melodies From Scotland’ went straight to the top of the iTunes classical chart. Classically trained, Sarah and Laura also bring a unique dimension as performers; they are one of the only acts in the world that play two instruments together (cello & violin) through one loop station. Another unique dimension they bring to performances is that they can swap instruments during the pieces they play. They recently made their live television debut, performing George Michael's 'Mother's Pride' at the BAFTAs. All of these achievements led to the girls winning a prestigious Young Scot Award. They've just recorded their debut album at Abbey Road Studios with the Royal Philharmonic Orchestra (released this September) – so the future looks very bright for the Ayoub Sisters.